Custom Neon Sign Quote -FREE QUOTE! NO OBLIGATION! Capture your business customers with an eye catching neon sign. We can create most any custom neon or led sign design that you would like. Fill out the form below, and we will have a neon or led sign quote for you within 24 hours. Your order will be received within 14 business days of order and come with free shipping and a one year warranty. All of our signs are MADE IN THE USA! You can contact us via email at: help@allneonsigns.com or via telephone at 800-283-3442 and ask for Melanie. Step 2: Please tell us more about the sign you are inquiring about? What text and/or image/logo do you want on your sign? Use the button below to upload your design idea Images. Step 3: What dimensions do you want your sign to be? In the text boxes below, please specify the approximate size needed for your sign. 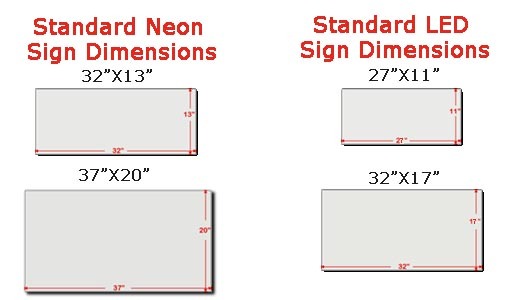 You may reference the images below to see most of our standard sizes; however, we can manufacture your sign in almost any size requested.